Mercantile Bank Senior Executive Vice-President Mohammad Iqbal Rezwan and Farazy Hospital Chairman Dr Anower Farazy Emon exchange documents after signing an agreement on health services at the bank’s head office in the city recently. 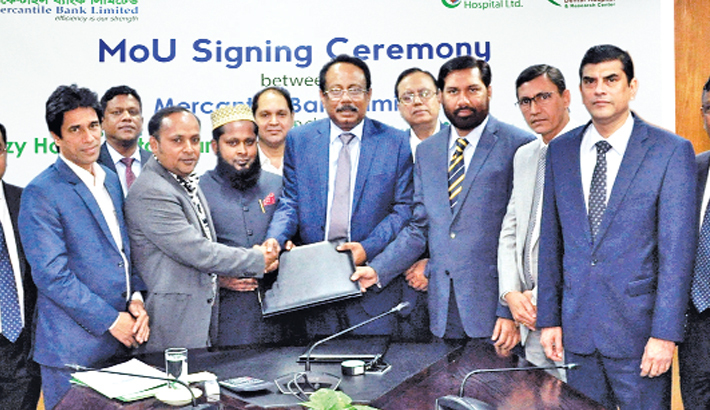 Mercantile Bank Limited has recently signed an agreement with Farazy Hospital Limited. The agreement was signed by Mohammad Iqbal Rezwan, SEVP and Head of HRD of the bank and Dr. Anower Farazy Emon, Chairman of Farazy Hospital Limited and Farazy Dental Hospital on behalf of their respective organisations at the bank’s head office in the city. Bank’s Managing Director and CEO Md Quamrul Islam Chowdhury was present on the occasion, said a press release.